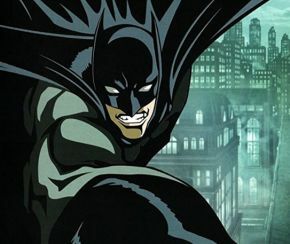 To celebrate the release of the new animated Batman Ninja (2018) on DVD, as well as the tenth anniversary of this movie, this Rewind Review will travel back to 2008 and revisit the Dark Knight Trilogy spin-off, Batman: Gotham Knight. Before joining the DCEU in 2016, Batman was all on his own and under the direction of masterminds, Christopher Nolan, Jonathan Nolan and the Blade trilogy creator, David S. Goyer, with Christian Bale as the Caped Crusader. Batman: Gotham Knight is an animated feature film set between the events of Batman Begins (2005) and The Dark Knight (2008), and features six interconnected short stories fleshing out both Gotham City and the mythology of Batman, similar to The AniMatrix and the Matrix Trilogy. Batman alumni, Kevin Conroy, who has voiced the Dark Knight in Mask of the Phantasm (1993), the animated series and the Arkham videogames, returns to voice him and proves to still be the perfect choice. He’s able to provide the lighter side of the character Bruce Wayne as well as the deeper and darker nature of the Batman. Andrea Romano’s casting is on point, as it always is, with the likes of Jason Marsden, Corey Burton and Jim Meskimen as the villainous expert marksman, Deadshot, who gets a whole story to himself, suitably titled “Deadshot”. We also get to see the return of Jonathan Crane’s creepy alter ego, the Scarecrow, who uses his poisonous toxins to control an underground army, including a brilliant version of iconic villain Killer Croc, in the story titled “In Darkness Dwells”. Being set in the Dark Knight universe, there are a few characters who made their debut in this film before making a proper appearance in The Dark Knight, including a few members from Lieutenant Gordon’s Major Crimes Unit (M. C. U.). It’s a nice thing to add and bridges the gap between the films greatly. The six stories are focused on different aspects of Batman’s personality, with the first, “Have I Got a Story for You”, showing Batman though the eyes of a group of skateboarding kids, each telling their own experience of seeing him, albeit a slightly exaggerated version of him, such as a living shadow, a man-bat and a robot. “Crossfire”, the second story focuses on introducing the M. C. U. and Anna Ramirez, who ends up getting caught in the middle of a violent shootout between rival gangs. Luckily, Batman is on hand to help them out. The film also expands on the reason behind Batman putting his life on the line, even if he has the technology to save himself, in “Field Test”. This story features the Dark Knight trying out a new EMP device that enables him to become bulletproof, but things go wrong when he engages the mob aboard their cruise ship. The stories are well told and manage to find a few connections to link them together. Each story is good in its own right, but as a film, it feels like reading through a selection of comic books, which may not be to everyone’s taste. The film combines both 2D and 3D animation to great effect, providing some stunning visuals that couldn’t possibly be recreated in live-action. Nearly every frame is hand drawn and looks all the better for it. Each story is created by a different animation team, with various types of Anime. Some are more Manga comic styled, while others are more contemporary and look completely different to many other films and shows. The animation allows for some incredibly fluid and engrossing action that is nothing short of gorgeous, and shows truly disturbing horrors that push this film out of kid’s territory, such as a quick trip through the grounds of Arkham Asylum. It’s able to contrast both the human and supernatural sides to the character in ways the live-action films can’t. In some ways, this is a better method of telling a comic book story onscreen, but it doesn’t quite deliver the human element that makes live-action more accessible. This is all on display in the best of the six stories, “Working through the Pain”, where Batman has been shot and is trying to make his way to the surface of the sewers before bleeding out. It’s intercut with flashbacks of Bruce Wayne learning how to deal with both physical and mental pain from a woman accused of being a witch. The colour scheme is cleverly and subtly utilised, with most scenes under either a blue or brown filter, helping to establish that this is set in the middle of the Dark Knight Trilogy, with Batman Begins having a brown colour scheme, and blue for The Dark Knight. The music was created by a few various composers, including frequent collaborator Christopher Drake. The score sounds brilliant and really captures the mood on screen. It sounds dramatic and provides a few eerie snippets, especially during the scene at Arkham. The music is that good, it wouldn’t sound out of place in a big budget live-action film. Overall, this is a visually stunning collection of shorts, and provides a truly unique experience for fans of the Caped Crusader that expands on the world of the Dark Knight trilogy and the legend of the Batman in interesting ways. Purple Revolver rating: 4/5. An interesting and unique experience.